The fascination and interest for the world that we inhabit, has been inherent to human nature since prehistoric times. Some of the cave paintings and other representations on bones and artifacts, which used to be viewed as mere artistic representations, have turned to be, according to the latest investigations, maps of hunting areas, streams, routes, and even maps of the stars. The oldest recorded route that we have evidence is a 9ft wall painting, found in 1963 of a town plan, showing buildings and a volcano, found in Anatolia, dated 6100-6300BC. It is also know the early representation of maps and routes by the old Egyptians on papyrus, but due to the short life of this type of surface, few evidences made it to our time. Sometimes, maps become more famous than their makers. Many cartographers only become famous for their contributions to the art and science of cartography after they’ve created a masterpiece. Others become famous, then create equally famous works for royalty, nobility, or well-known explorers of their time. Still others make a famous map, then disappear from history forever. Throughout history, there are five maps that have been particularly noteworthy. From the earliest maps to maps that have played a significant role in history, listed here chronologically are notable events in the history of mapmaking as well as the world’s oldest maps. The list is in progress; to submit a map or cartographical event for consideration, please email your submission to editor@gislounge.com. It was the Greek civilization the one that helped to develop enormously the understanding of cartography as an important science for the society in general. Ptolemy, Herodotus, Anaximander, Eratosthenes, all had tremendous influence on western earth sciences, including geography. They performed deep study of the size and shape of the earth and its habitable areas, climatic zones and country positions. Anaximander, for instance, was the first to draw a map of the known world, while Pythagoras of Samos speculated about the notion of a spherical earth with a central fire at its core. When the geographers of the Greek era started estimating scientifically the circumference of the earth, a huge impulse was given to the cartographic science. Eratosthenes, already in the 3rd century BC, contributed greatly to the history of geographic knowledge with his Geography and accompanying world map. Unfortunately we only have indirect references to this work through other authors like Strabo from Elea, whose work is far better known in our time. During Roman times, cartographers focused on practical uses: military and administrative needs. Their need to control the Empire in the financial, economic, political, and military aspects, made evident the need to have maps of administrative boundaries, physical features, or road networks. Roman maps where more or less restricted to the area comprised by what they called “Mare Nostrum”, since this was the core of the Roman Empire and around which all the administrative regions were distributed. 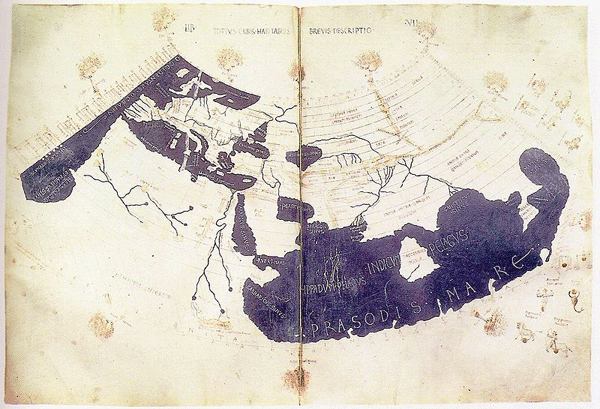 The Ptolemy map is notable for its probable role in the Roman expansion. Ptolemy wrote his Geographica around the year 150 AD, and refers to a system of latitude and longitude, as well as a means of describing locations on earth based on astronomical observations from those areas. Ptolemy’s original maps were never found, having presumably been lost over the years, but his work was descriptive enough that cartographers were able to recreate his observations in 1300 AD, and create the Ptolemy map. Ptolemy’s idea of using a latitude and longitude system had a significant impact on the work of later cartographers. During this middle age times, Muslim scholars continued and advanced on the mapmaking traditions of earlier cultures, mostly following Ptolemy’s methods; but they also started using the knowledge, notes and writings of the explorers and merchants during their travels across the Muslim world. There were advances in a more accurate definition of the measure units, plus great efforts in trying to describe and define the calculations of the circumference of the earth. There were also numerous studies and methodologies to draw a system of meridians and parallels that helped greatly to the evolution of the science of Cartography, like those created by Ibn Batutta or Al-Idrisi. Tabula Rogeriana by Al Idrisi, isn’t just a map of the world- it’s an extensively researched geographical text that covers natural features, ethnic and cultural groups, socioeconomic features, and other characteristics of every area he mapped. This work was created for King Roger II of Sicily. Al Idrisi drew upon his own extensive travels, interviews with explorers, and draftsmen paid to travel and map their routes in order to create the maps in the Tabula Rogeriana. These maps describe the world as a sphere, and break it up into seventy different rectangular sections, each of which is discussed in exacting detail in the remainder of the Tabula. “Mappa mundi” is a generic term for medieval European world maps. The Hereford Mappa Mundi is notable for being the largest medieval map still in existence, as well as one of the most elaborately drawn and colored. The illustration of the map itself is circular, with Jerusalem placed at the center of the map, the garden of Eden in a ring of fire near the top of the map, and the whole thing oriented with east at the top. One odd feature of the Hereford map is that Europe is mislabeled as Africa, and vice versa. Though the map is circular, experts don’t think it’s evidence that the cartographer believed in a flat earth. 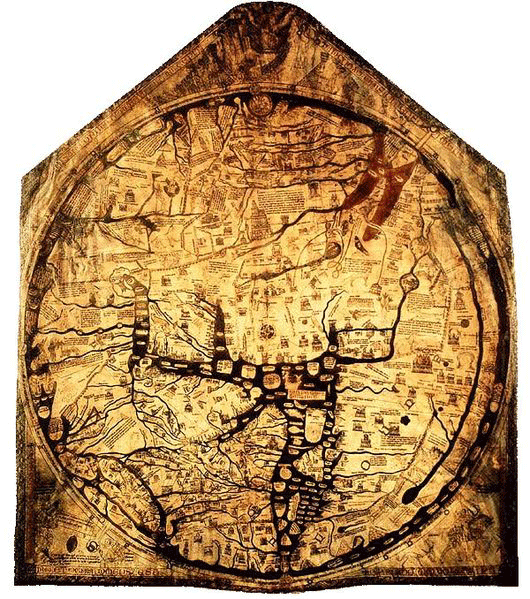 Instead, the Hereford Mappa Mundi is widely regarded as being a type of projection, with the uninhabitable regions to the north and south omitted from the map. Hereford mappa mundi, ca. 1300. The Fra Mauro Map was created by the monk Fra Mauro around 1450 AD. It’s considered one of the finest pieces of medieval cartography in existence. It’s a large round map, around two meters in diameter, painted on vellum and stretched in a wooden frame. The map itself depicts the known world at the time- Europe, Asia, and Africa. 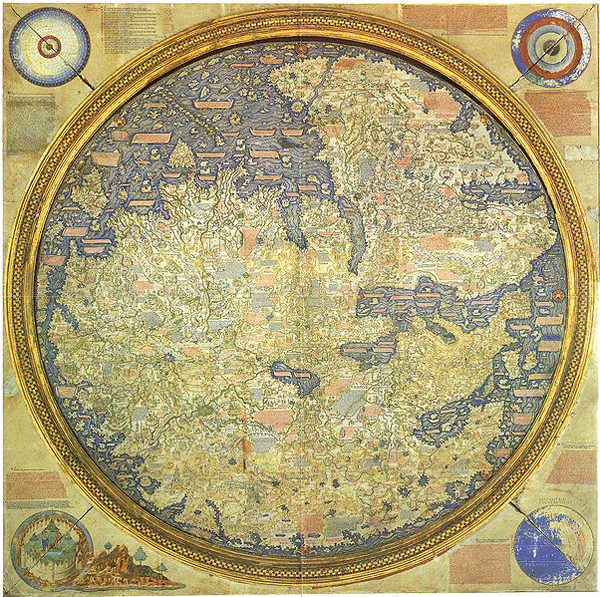 One interesting feature of Fra Mauro’s map is that it is oriented with south at the top of the map, as opposed to the Ptolemy map, another well-known historical map. Fra Mauro chose this orientation instead of Ptolemy’s northern orientation because he felt that Ptolemy’s map was no longer accurate, having been created based on information gleaned from works of Ptolemy dating from long before much of the world had been thoroughly explored. Printing, plus the big impulse in the developing of different methods of surveying and new instruments of measurement that took place specially during the 16th century, were responsible for the rise of cartographers as influent people in the most powerful countries of the world. The commercial expansion, the colonization of new parts of the world, and the search for military superiority over other countries, brought the realization of the need to accurate maps to control as much as the world as possible, putting great emphasis on the cartography of the coastal areas and the new inland regions discovered during these times. 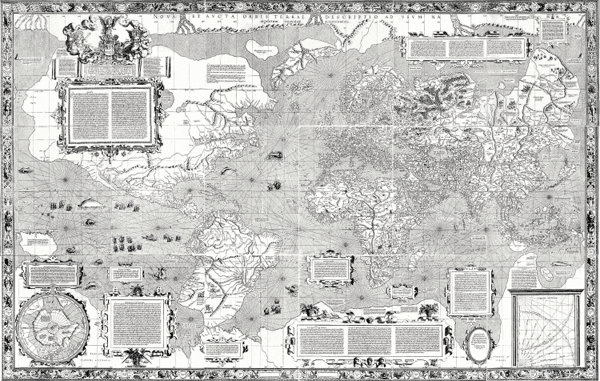 The Spanish sailor and cartographer Juan de la Cosa, for instance, created the first cartographic representations of the Americas, and other maps of Africa and Eurasia as well, and many others followed and even improved his cartographic work. But the big advance in the cartographic science came in 1569, with the publication of Mercator’s first maps. His mapping techniques were improved later in 1570, when Abraham Ortelius published his Theatrum Orbis Terrarum, which, for the first time, included maps based on the best available purely contemporary information. Gerardus Mercator’s Mercator Map is notable for being the first attempt to make a round earth look “right” on a flat surface. The problem inherent in representing a spherical shape on a flat plane is that things tend to get distorted. Lines of latitude and longitude, useful for navigating a globe, become warped and useless on a flat map. Mercator sought to account for this by keeping the lines straight, and distorting the size of objects closest to the poles. The result was the Mercator projection, an invaluable tool for navigation at sea. Because the Mercator projection allowed for straight lines, called loxodromes, it was much easier for ships’ navigators to use to chart a course, despite the trade-off of distortion. 1602 Ricci Map (also known as the Impossible Black Tulip) was composed by Jesuit priest, Matteo Ricci in 1602. The world map is the oldest surviving map in Chinese to show the Americas. The map shows China at the center of the world. After the Industrial Revolution, trading and commerce, increased enormously throughout the world. The post industrial revolution era also brought the rise of a middle class who started to be able to afford luxuries such as books and travel. Travel for pleasure became a big interest for the burgesses, while travel for business was a matter of big importance for merchants and other members of the aforementioned emergent middle class. Geographers and cartographers had to respond to the increasing demand of that middle class, and therefore, another impulse was given to cartography and the mapmaking professionals. Large decorated, almost artistic creation of folio maps, so popular during previous centuries, gave way to smaller, more practical and portable maps with smaller features that gave more importance to the accuracy of the elements represented than to the decorative meaning of the map. Later, during the 19th century, railroads expanded rapidly throughout the world, making travel faster, cheaper and more accessible to more and more people. Cartographers put more of their energy and effort in producing up to date maps, showing the latest extensions to the railroad network. During this time, maps normally eliminated the remaining decorative features and became almost entirely factual. Maps usually become famous for being particularly beautiful, revolutionary, or historically significant. Though works like the Ptolemy Map are virtually useless for navigating or locating anything, they provide a valuable look into what cartographers, explorers, and geographers of the time understood about the world around them. Some, like the Mercator Map, still have value today when it comes to creating different map projections for different purposes. Modern cartography found an essential tool in the use of computers. 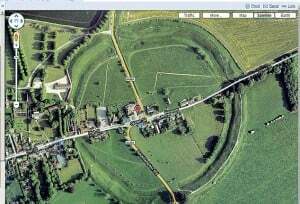 As technology improves, cartography and the tools related to it improve as well. The new generations of mapmakers and map users are well instructed in the use of computers and of the peripheral instruments that we are so familiar with, like plotters, printers, scanners, along with image processing, spatial analysis and database software. 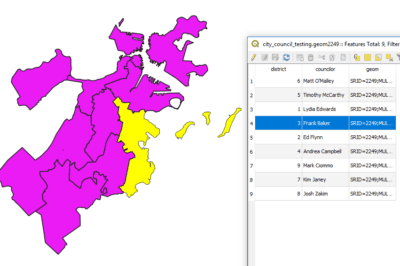 GIS has become global, and GIS Analysts and Specialists, have emerged as the new gurus of cartographic science. Almost anything can be studied now from a geographic point of view. Also, some technologies that previously were restricted to military uses, like GPS or Remote Sensing, plus the globalization of data, with the use of internet, web mapping services, new software applications, contributed greatly to the use of GIS and Cartography for more and more applications every day. 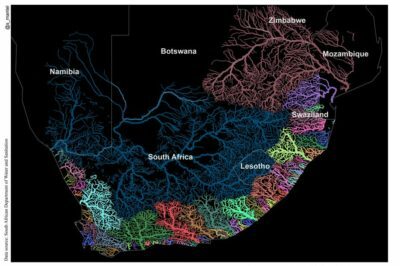 Technology advances so fast, that is hard to predict what is going ot be the next step in the development of cartography. 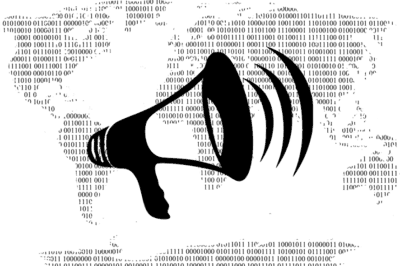 Today is the transfer of cartography and GIS software applications to mobile devices, but tomorrow is still a big question mark. No doubt, though, that computer technology was the new big revolution in the history of cartography and the start of a new era in the art and science of map making. The list is on the Eurocentric side with most on the list having been created by Europeans.